7 Gloucester is located on the NE corner of Gloucester and Marlborough, with 5 Gloucester to the north, 9 Gloucester to the south, across Marlborough, 323 Marlborough to the east, and 8 Gloucester to the west, across Gloucester. 7 Gloucester was designed by architect Frederic H. Moore and built ca. 1873, one of three contiguous houses (3-5-7 Gloucester) with brick façades. 3 and 5 Gloucester were both built with three stories plus basements. 7 Gloucester either was built with four stories plus a basement or was remodeled soon after it was built to add a fourth story (it is shown as one story higher than 3-5 Gloucester on the 1887 Sanborn map). 3-5-7 Gloucester were built for building contractor Samuel Tarbell Ames, three of five houses at the northeast corner of Marlborough and Gloucester that he built at about the same time for speculative sale. The other two, at 321-323 Marlborough, also were designed by Frederic H. Moore but with brownstone façades. The houses at 3-5-7 Gloucester were built first, on land owned by the estate of Joshua Stetson, with a depth of 54 feet on Marlborough. On February 1, 1873, after the houses were completed, Samuel T. Ames and Frederic H. Moore purchased the land from the Stetson estate. They sold 3 Gloucester and 5 Gloucester to individual buyers; 7 Gloucester became the home of Samuel Ames and his wife, Mary Hartwell (Barr) Ames. On February 13, 1873, Samuel T. Ames purchased the lot to the east, with a 48 foot frontage, from William Gaston. 321-323 Marlborough were built on the eastern 45 feet, and on August 1, 1873, he sold the remaining 3 feet to the west to the owners of the three houses at 3-5-7 Gloucester, who thereby increased the depth of their lots from 54 feet to 57 feet. The original deeds for 3 Gloucester and 5 Gloucester included easements at the rear of the properties providing for a three foot six inch passageway to permit passage and drainage from 3-5-7 Gloucester to the alley. When the owners of the houses purchased the additional three feet of vacant land adjoining 323 Marlborough, they also agreed to move the easement three feet to the east, so that it remained at the eastern edge of their properties. 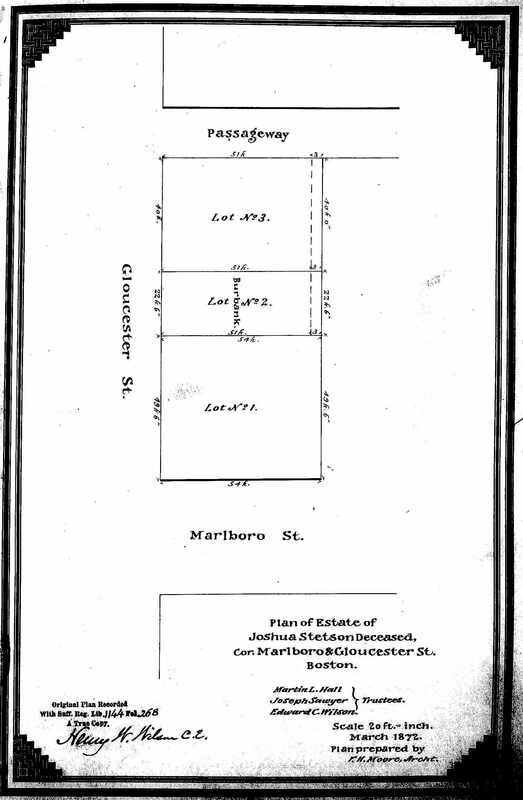 Frederic Moore is shown as the architect for 3-5-7 Gloucester on a plot plan recorded with the deed by which he and Samuel T. Ames purchased the land from the Stetson estate. 321-323 Marlborough are attributed to Frederic Moore by Bainbridge Bunting in his Houses of Boston’s Back Bay. 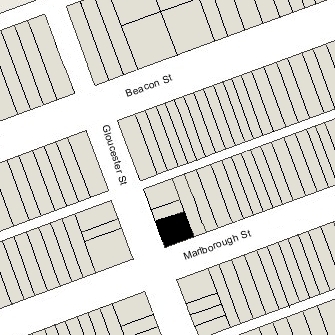 All of the land on which 3-5-7 Gloucester and 321-323 Marlborough were built was part of one of several parcels originally purchased from the Boston Water Power Company on January 29, 1866, by a real estate investment trust formed by John Templeman Coolidge, Franklin Evans, and Charles Henry Parker. The trust had subdivided the property into lots, which it sold to investors and builders, who then frequently resold the lots to others. Click here for an index to the deeds for 7 Gloucester. On February 1, 1873, 7 Gloucester was acquired from Samuel Ames and Frederic Moore by Samuel Ames’s unmarried son, James Barr Ames. He was a Harvard law professor and lived in Cambridge. Samuel and Mary (Barr) Ames made 7 Gloucester their home. They previously had lived at 47 Hancock. During the 1878-1879 winter season, Samuel and Mary Ames were living elsewhere and 7 Gloucester was the home of Channing Clapp and his wife, Susan Prescott (Sohier) Clapp. He was a cotton merchant and manufacturer, and later would serve as president of the Calumet and Hecla Mining Company. By 1880, the Clapps had moved to 55 Mt. Vernon and 7 Gloucester was once again the Ames’s home. Mary Ames died in May of 1893 and Samuel Ames moved soon thereafter, probably to Cambridge where he died in May of 1897. During the 1893-1894 winter season, 7 Gloucester was the home of Mary (Fenton) White, the widow of Jean White. Their eight unmarried daughters — Susan, Fanny, Elizabeth, Grace, Florence, Edna, Ruth, and Agnes — probably lived with her. Jean White was a musician and music publisher. After his death in February of 1884, Mary White continued to operate his publishing company until 1908, when it was purchased by Carl Fischer. By the 1894-1895 season, she had moved to 365 Marlborough. 7 Gloucester was not listed in the 1895 Blue Book. During the 1895-1896 winter season, 7 Gloucester was the home of Dr. Lena V. Ingraham and Dr. Ella L. Dexter. They previously had lived at 68 Marlborough with Dr. Grace Wolcott. Dr. Ingraham was a physician. She and Dr. Wolcott were the first medical staff members of the Vincent Memorial Hospital when it was founded in 1891 to provide medical services to wage-earning women. Dr. Dexter was a physician and ophthalmologist. By the 1896-1897 season, Dr. Ingraham had moved to the Hotel Bristol (northwest corner of Clarendon and Boylston) and Dr. Dexter had moved to 416 Marlborough. By the 1896-1897 winter season, 7 Gloucester was the home of George H. Blake and his wife, Eleanor (Morrison) Blake. He was agent for a rubber mill. 7 Gloucester also was the location of Miss Caroline L. Rideoute’s School. It previously had been located at 71 Brimmer Miss Rideoute lived at 16 Brimmer Street. By 1898, the Blakes had moved to Concord and Miss Rideoute’s School was no longer at 7 Gloucester. 7 Gloucester was not listed in the 1898 and 1899 Blue Books. On June 24, 1899, 7 Gloucester was purchased from James Barr Ames by Elizabeth (Russell) Haskell, the widow of Francis Hathaway Haskell. Their daughter, Sarah A. Haskell, lived with her. They previously had lived at The Warren (Warren and Regent Streets in Dudley Square). After she acquired 7 Gloucester, Mrs. Haskell had a two story rear addition built between her home and 323 Marlborough, using the western half of the wall of 323 Marlborough as the rear wall of the addition. To facilitate its construction, on August 25, 1899, she purchased from Mary Morss, owner of 323 Marlborough, a six inch strip of land 22 feet wide (north-south) with the western half of the wall of 323 Marlborough on it, and they agreed that, thereafter, that portion of the wall would be considered a party wall between the two houses. The addition may not have been built immediately, inasmuch as it does not appear on the 1902 Bromley map, but is shown on the 1908 map. Elizabeth Haskell died in September of 1909 and 7 Gloucester was inherited by Sarah Haskell. She continued to live there in 1910, joined by her brother, Francis Hathaway Haskell, Jr., and her uncle, William F. Russell. Francis Haskell was divorced and William Russell was a bachelor. They all had moved by 1911, Sarah Haskell and Francis Haskell to Brookline, and William Russell to the Hotel Carlton at 1138 Boylston. Sarah Haskell continued to own the house and lease it to others. By the 1910-1911 winter season, 7 Gloucester was the home of Malcolm Scollay Greenough and his wife, Lizzie (Tiffany) Greenough. Malcolm Greenough had served as treasurer of the Boston Gas Lighting Company and then as president of the Cleveland Gas Light and Coke Company. He retired in 1907. Lizzie Greenough died in February of 1911. Malcolm Greenough continued to live at 7 Gloucester. At the time of the 1920 US Census, his son and daughter-in-law, Charles Pelham Greenough and Margaret Bliss (Perkins) Greenough, and their two sons, Pelham and Hamilton Greenough, lived with him. Charles Greenough was a stock and bond broker. Their usual residence was in Brookline. On August 3, 1926, Sarah Haskell transferred 7 Gloucester to a trust she established for her benefit, with George C. Lee, Henry M. Hutchins, and herself as trustees. She transferred the property in anticipation of her marriage in August of 1926 to Charles Morris Watson, a real estate dealer and stockbroker. 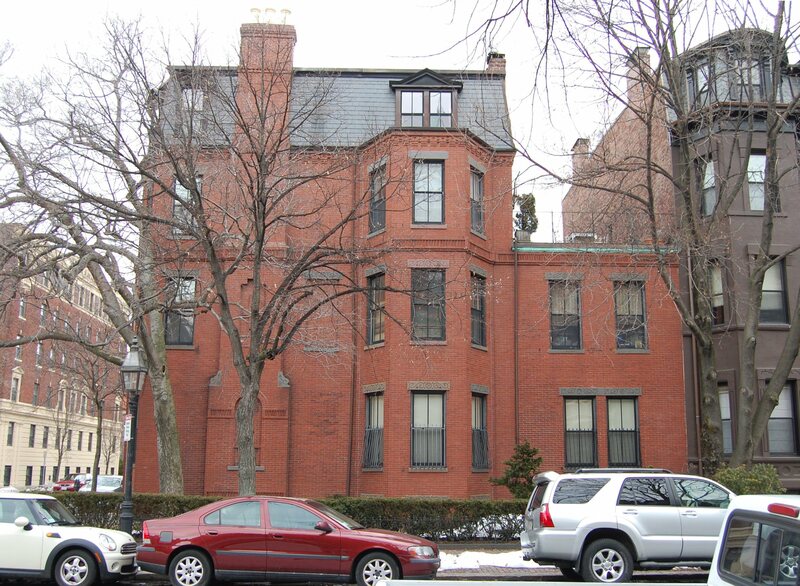 In about 1924, Sarah Haskell and Francis Haskell had moved from Brookline to an apartment at 31 Massachusetts Avenue. 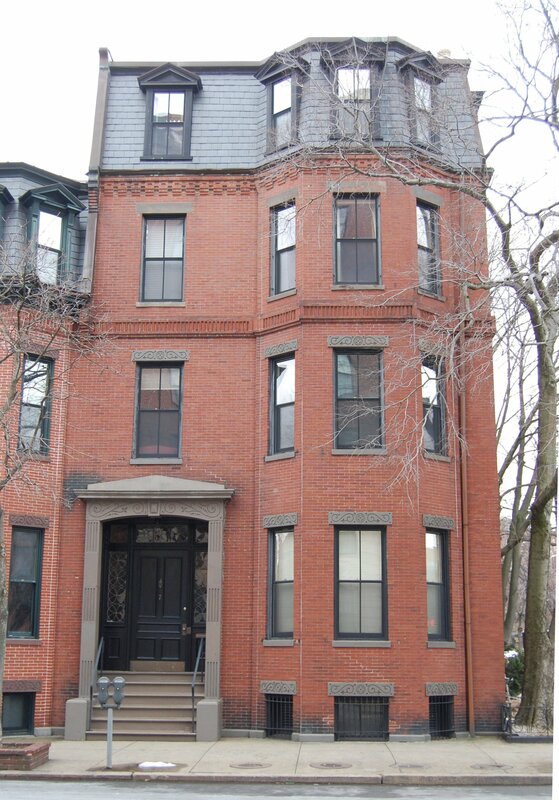 After their marriage, Charles and Sarah Watson lived there and Francis Haskell moved back to Brookline (he died in March of 1927)..
Malcolm S. Greenough continued to live at 7 Gloucester until his death in May of 1932. By 1933, Charles and Sarah Haskell had made 7 Gloucester their home. They continued to live there until about 1940, when they probably moved to Brookline (where she died in 1941). In April of 1941, 7 Gloucester was acquired from Sarah Haskell’s trust by Alma Vorland. By 1942, it had been converted into apartments. In December of 1943, 7 Gloucester was acquired from Alma Vorland by real estate dealer Ray C. Johnson. In August of 1947, the E. G. Morris Service Company (presumably acting on behalf of Ray Johnson) applied for (and subsequently received) permission to add a separate entrance to the basement apartment, on the Marlborough Street side of the building. The original application indicated that the current and proposed occupancy was three apartments; in December of 1947, the company filed an amendment to clarify that this was an error and the current occupancy was five apartments. In February of 1948, 7 Gloucester was acquired from Ray C. Johnson by William A. Sargent, and in December of 1953, it was acquired from him by Walter S. Gainey. Both William Sargent and Walter Gainey probably were acting for attorney and real estate dealer Maurice Eli Goldberg, who acquired the property in March of 1959 as trustee of the M. E. Goldberg Charitable and Educational Trust. Maurice Goldberg died in July of 1972, and in April of 1976, 7 Gloucester was acquired by Stephen A. McCabe and Philip R. Daoust. In June of 1976, they filed for permission to change the occupancy from three to four apartments. The application subsequently was abandoned. In February of 1984, they filed for (and subsequently received) permission to legalize the occupancy as four units, indicating that was the existing condition. 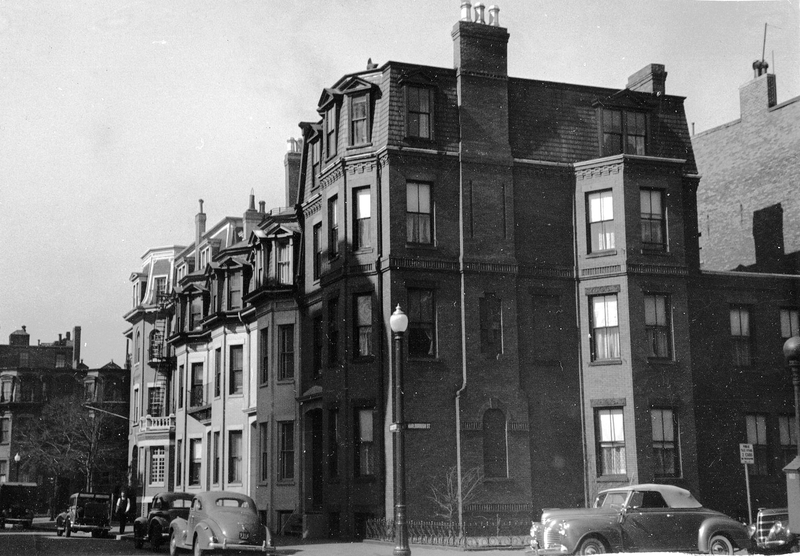 And in May of 1984, they converted the property into four condominium units, the 7 Gloucester Street Condominium.